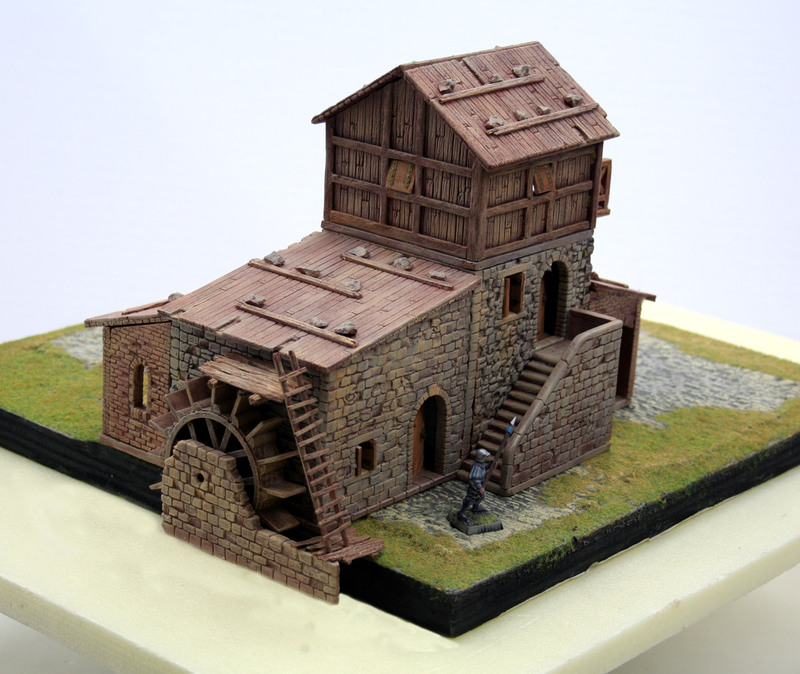 These ruins are suitable for miniatures of 25 – 35 mm. Each item is completely assembled and finished. We leave you to the vision of the new Pre-painteds #02. Miniatures by: Zealot Miniatures Kickstarter. As promised, we are now showing you an article dedicated to the collaboration with another company we hold dear. We are talking about the excellent pieces of Zealot Miniatures. We did receive last week a package from the UK and inside were 8 gorgeous miniatures, cast in resin. David and I were impressed by the quality of the product, even though this is nothing new, coming from Zealot. In the past, we already did a collaboration with them showing their spectacular dungeons goodies of their first Kickstarter (Twisted Catacombs), teaming them up with our rooms of our “Forgotten Halls” project. Let’s get more into specifics: those 8 miniatures Zealot send us are related to a new Kickstarter, already under way, about fantasy miniatures for dungeons. Unlike their precedent 2 Kickstarters, the stamps are not made by computer digitally but by hand, by the sculptor “Boris Woloszyn”. Well … let’s just say that looking at those miniatures brought me back to the 80’s, but with a way more clean and modern look, which definitively catches the eye. Even the production options the Kickstarter gives you is a wink to the past: you can choose the miniatures to be cast in White Metal (classic but old-style), in standard Resin, or Premium Resin (last-generation resin very resistant and still quite flexible). As soon as we received the miniatures we couldn’t resist and thus placed them on one of our “3D Bases”. The overall result is just great, they do fit perfectly! We are sure Zealot’s new Kickstarter will be yet another success. To know more about it go directly on the Kickstarter page of Zealot Miniatures. It’s been nearly a year I didn’t publish anything or give any news. I must admit 2017 and a good part of 2018 was quite harsh, and I can say, even dramatic, for me. I don’t want however to bore you with tedious explanations. Now, we’re at the start of October and I can say that these last 2 years are behind me, with a somewhat positive outcome. I am not speaking of the overall’s company outcome, but the health one. I never lost my positive thinking, which allowed me in the past to overcome many difficulties. So to happy thinking and to excellent surgeons it is! In this year of silence even the work helped me a lot. It allowed me to go forward and project a lot of cool stuff we will publish in the future. Keep your mind busy is the best of medicines, I can assure you. The next medicine is keep in contact with people. And indeed the first article we will write again is dedicated to a long-time collaboration which has been going on for years now. Big thanks to all of you who follow my blog, and to all who were close to me in this last difficult period. We are finally now talking about herbs and bushes. This is the third article about painting/finishing your 3D Bases. The first article was about “how to repair a 3D Bases”, while the second article was about “how to paint a 3D Bases”. Now let’s go into this third part. First of all, put a layer of PVA glue (Vinavil), slightly diluted with water, on the parts where you want the herbs to be put. This layer will allow the herbs to stick better to the 3D Bases. Then put a generous amount of fiber herbs on the area, don’t hesitate to make the herbs stick well to the glued area by pushing it with your fingers. You can find this kind of herb in most modellism shops, like the ones for train dioramas. Third step: after a few hours, when the glue will be quite dry, use a brush to remove the excess herb which didn’t stick. Fourth step: now use a (very) drybrush with a golden/yellow + beige color on all herbs zones. The beige is for giving a link between the color of the earth, allowing a smooth transition, and to also smooth away the not-very-nice yellow that you will probably put on earth and stones while drybrushing. I prefer myself to use bushes already ready for train dioramas (or you can follow if you prefer this tutorial). The final result is quick and very nice. Then cut some pieces of brushes as you deem fit and glue them with the same PVA glue. With these 5 steps, you’ll have a wonderful result. Now that the base is completed, I must admit I like very much the result. 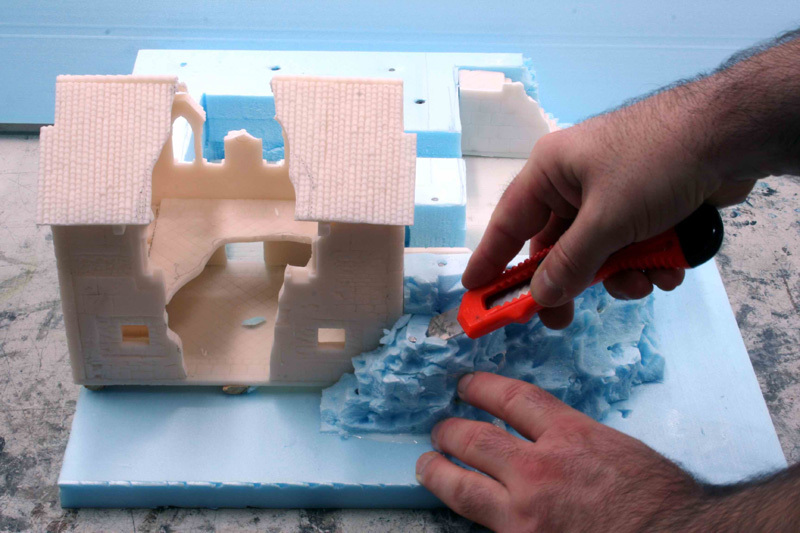 In the next article, we’ll show you how to glue a 3D Bases to a wooden or polystyrene panel. In our last article we did show you how to repair and give new life to a 3D Base with some small bubbles in it. Actually, we went further, since we repaired a 3D Base which was heavily damaged (bubbles and holes). Now, after repairing it, we decided to go further and paint it. The result is excellent. And all this happened with only 3 color passages, after the black primer given with the black spray. Once the black spray’s part is done, let the 3D Base try after for at least 3-4 hours. Then drybrush with a dark brown acrylic paint the whole. The second passage is still by drybrushing, but with a beige color. Last, use some grey/blue mixed with some beige, to give a final touch to stones and columns. As you can see, the overall result is very nice. Can you imagine it was a very damaged base just a few hours ago ? This 3D Base is ready to play. For those who wants an even more realistic result, they can add grass and bushes. This will be the scope of our next article. Today we’ll be speaking about the issues of seeing some small bubbles in the 3D Bases. The appearance of small bubbles is something difficult to prevent altogether during production, due to the nature of the material, and it not being cast in a vacuum. However, there is an easy way to fix those small bubbles, for the backers worried about such issues. For this article, we took one of the bases which was rejected after production, since it had too many mistakes. As you can see on the image, indeed, we would never have sent such a base to you. The procedure is very very simple. You will need an elastic sealant. We did use here a white elastic sealant from Saratoga, but any brand or similar sealants, of course, will do the job. What is important is take a sealant that can be paintable as to allow, of course, painting once the job is done. To avoid getting my index dirty I am using a latex glove. Once my finger is protected, I am taking some small quantities of sealant and with the index I put it on the imperfection/bubble, covering it fully. To “repair” this base, all it took was 20 minutes of work. Once this is done, you need to let the sealant dry up (in this case, 45 minutes), and you’re ready to give the base its first primer. To do this, we used an acrylic black spray can (which is perfect for the sealant). Here I show you the difference “before/after”, by putting only the spray on half the base. As you can see, the result is excellent. Once the spray is put, I assure you won’t notice any difference between this base, which was supposed to be thrown away, from one perfectly cast. Of course, you won’t have to deal with such a damaged base, but maybe with some token few small bubbles. So it will be way quicker to reach the same great result. The spray has also a great advantage, having done the job of a primer. You just now need to paint, and it’s done! In the next article, you will see how to paint and finish this base. 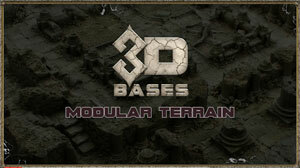 3D Bases: worked by backers! The first link is a tutorial made about how to paint and give some finishing touches to our Stone slabs and Transitions C/R bases. Excellent painting, really, and nicely explained. The next link is also an article of JerzyK, about a more complex 3D base. He is indeed working on the Broken Column, which isn’t more or less flat like the previous bases, but with quite a tridimensional relief and landscape. Even here, Jerzy manages to explain very smoothly and nicely how to paint it. Thanks to Jerzy for sharing this very well done work with us! The last image is about a picture posted on our 3D Bases Facebook page by Ulrich Ilg, another backer. We must say we are also very impressed with the result, he pained and added quite some stuff on the whole Cloister section of the Abbey. Don’t hesitate to post other pictures and tutorials about your work on our 3D Bases! We love them and can’t wait to see more. Thanks in advance for all your love! Update 17 – Forgotten Halls: Into the Boxes!!! video, which shows the huge amount of pieces contained in both boxes. thousands combinations doable with our gaming pieces. Just imagine what you could reach by adding more boxes! create a terrain area up to 30×30 cm. (around 1’x1′). reach a length of 90cm of corridors. perfect-looking result, with the best definition and result possible. finished realistic look never seen around. and wall supports will be inside to support and ornate your walls. dungeon / building upstairs and downstairs. Door and introduces quite a few new pieces. movable stairs, to be put easily wherever you wish. floor every time you want to play at a lower floor. terraces, opening options for your creativity. create bridges of various sizes very easily, even between buildings. What about the price ? More information on the matter will be written in a future update. information about these 2 Forgotten Hall boxes! Great summer holidays for all of you! RealGameFX Fog Monster Kickstarter Launched!!! The project is simple, but mind-blowing. By participating in their Kickstarter, you will be able to add a Fog effect to all your gaming terrains with ease, for a complete different immersive result! The Fog Monster pledge and the Dark Crypt pledge, both will allow you to swarm your terrain and miniatures with a rolling and billowing fog! 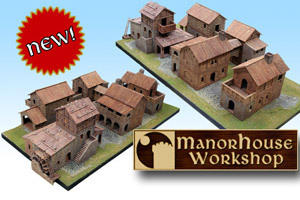 And yes, as you can see, the Dark Crypt was developed by Manorhouse Workshop, as a start of a beautiful collaboration. There is much more to be seen and offered in RealGameFX’s Kickstarter. Today we would like to thank “Jerzy Krzyzanowski”, one of our backers of our Kickstarter “3D Bases”! Once he received his 3D Bases he thought about doing a review about our product, on Chest of Color (a quite well-know community of painters who do amazing work). Jerzy did make a detailed review, showing the qualities and the issues of our product, with a lot of images to illustrate everything. Thanks again, Jerzy and we can’t wait to see the painted result!